REGENSBURG (David Hein’s Eye on the Future) – The United States will be the clear favorite at the 2013 FIBA U19 World Championship for Women and the goal for every other team will clearly be to avoid the four-time reigning champion Americans as long as possible in the knockout stages. Team USA have dominated their way to the last four titles – they are five-time winners in all, taking into account the 1997 crown – though they did lose one game at each of the past two championships – against Spain in 2009 and Canada in 2011. The Americans were drawn into Group D with hosts Lithuania, Mali and China. And it would be a surprise if they fall to any one of those teams. The top three from Group D join the first three from C – which has Canada, the 2012 European U18 champions from France, debutants Netherlands and Senegal – in the Eighth-Final Round. Group C promises to be entertaining as the Canadians always put together a competitive team; the French look to confirm their European crown from last summer; and the Netherlands come into their first U19 Worlds showing after a strong recent development. The African side Senegal have also worked hard to improve their game and returned to the tournament for the first time since the original competition in 1985. None of those other teams will face the Americans in the Quarter-Final as the groups crossplay with the other top four teams. But avoiding Team USA as long as possible is likely the goal of all the teams from Groups A and B. Group A features 2011 bronze medalists Brazil, 2007 bronze medal winners Serbia, 1985 silver medalists Korea and Russia, the 2001 silver medalists. And Group B has the quartet of 2009 bronze medal winners Argentina, Japan, 2009 and 2011 runners-up Spain and Australia, winners in 1993 who also medaled in 1989 and 1997. More than any other team, Spain will be looking to avoid the Americans as long as possible. They lost to the United States in the 2007 Semi-Finals and then were dropped by Team USA in the Final both in 2009 – after having beaten the Americans in the first game of the tournament – and in 2011. And the Spanish will be battle-tested in the first round as they face a tough group. Argentina are always a strong team, Australia as well and even Japan has improved greatly, reaching the 2011 U19 Quarter-Finals and the 2012 U17 World Championship for Women Semi-Finals. As so often, the tournament will have a number of stars who will long be in the spotlight in the world stage. 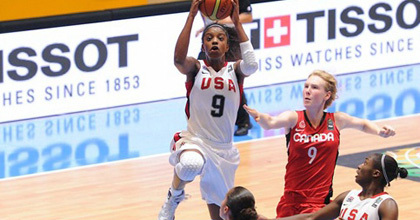 American Diamond DeShields already has two World Championship gold medals to her credit, winning the 2011 U19 crown as a 16-year-old and taking the U17 title last summer. Another expected leader for the USA team will be Breanna Stewart, who has four golds in four summers – including the 2010 FIBA U17 World Championship for Women title and the 2011 U19 crown. Spain are expected to give the Americans probably the biggest challenge, especially with the impressive trio of Astou Ndour, Leticia Romero and Maria Arrojo. Other top players will be Olivia Epoupa of France, Australian Stephanie Talbot, China’s Yang Li Wei, Izabella Sangalli of Brazil and Mariam Maiga of Mali.